Newcastle-upon-Tyne is a surprisingly small city - there are 19 other cities and towns in England (measured by Urban Area) that are larger than it. However, where Newcastle scores highly is that it has never been afraid to think big and act like a big city - seemingly much to the annoyance of nearby Sunderland! This is not a new phenomenon. Newcastle has thought big for a long time - and once upon a time it (along with the other towns on Tyneside) thought big about transport and motorways in particular. In 1953, Newcastle City Council produced their Development Plan. This, in common with other Development Plans across the country, included a section looking at transport issues. One of the major proposals within this section was for a surface-level Ring Road. This route of this road between the Tyne Bridge and the Great North Road would look familiar to modern eyes - it's exactly where the modern A167(M) Central Motorway is. The Ring Road would have had junctions with Jesmond Road and New Bridge Street, but there was no provision for amending the street pattern in the area. The 1963 Development Plan Review thought big. I mean really, really big. The growth in social economic standards accompanied by a major growth in motor vehicle ownership has necessitated a re-assessment of central area land use, and a basic change in the fundamental thinking on the relationship of the principal traffic routes to the Central Area. The ring road concept envisaged radial routes connecting to an inner ring, the theory being that traffic would circulate around the inner ring, only entering the central area if absolutely necessary and then at the junction most convinient to the destination. The tremendous growth of traffic has necessitated a new basic road network to ensure that traffic adheres to the motorways and does not, because of convenience and shorter journey time, choose to cross the central area by means of the existing street pattern which would have been the case in the 1953 plan proposals. The 1963 Development Plan Review therefore provides for a more sophisticated road layout and junction design, with a major east-west motorway linking New Bridge Street with Percy Street and a lower east-west road, not of motorway standard, linking City Road with Scotswood Road. So far, so good. There's mention of large changes, and a new link road across the north bank of the Tyne. However, were they thinking beyond just big roads? 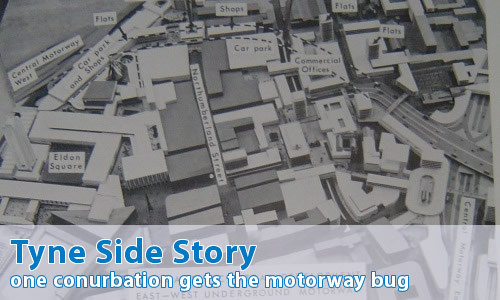 By siting multi-storey car parks adjacent to and gaining direct access from the motorways, traffic on the central street pattern can be limited to that servicing business premises and a limited number of short term parkers. The news and fumes resulting from the intrusion of the motor vehicle can be limited to ensure acceptable standards of environment within the central area. That sounds in places as if it could have been written in the last few years. However, the next extract would not see the light of day if written in the present. ...the major highways in the City shall be Urban Motorways. These are routes which link with the national road network and which are designed to carry heavy volumes of traffic in the future. No frontage development will be allowed unless the development is fundamental to the effective use of the motorway, for example direct access to multi-storey car parks servicing the central area. None of these car parks have been built in Newcastle. How would they have looked? Probably something like the unusual Woodhouse Lane car park, reached via direct access sliproads from the A58(M) Leeds Inner Ring Road. So which roads would have become motorways? Just to throw spanners in the works a little, some of those proposed Urban Motorways are mentioned nowhere else, and it is speculated that barely any engineering work was done on those routes. Very interesting. What else does the Review talk about? Thanks to Ian Bailey, Peter Stewart, Ryan Barry and Chris Marshall for their help towards the production of this feature.